(Nanowerk Spotlight) Nanotechnology is increasingly being researched for applications in the construction industry (here is an overview of nanomaterials in construction) and cement – as the most important building material – is a particular focus. A few weeks back we covered a novel, solar-powered process that would make cement production a much greener process than it is now ("Solar-powered cement production without carbon dioxide emissions"). Apart from reducing the damaging environmental side effects of cement production, another research focus is on reinforcing concrete to improve its mechanical performance (also read this article about nanotechnology and concrete). "When researchers think of nanomaterial reinforcements for concrete, carbon nanotubes (CNTs) come as first option," Andres Ayuela, a research scientist at the Centro de Física de Materiales in San Sebastian, Spain, tells Nanowerk. "The problem with carbon nanotubes is that they are water insoluble. In order to make them compatible with water chemistry, they must be functionalized in advance." To get around this problem, Ayuela and a team of scientists from the Donostia International Physics Center (DIPC), Materials Physics Center (CSIC-UPV/EHU),Tecnalia and University of the Basque Country (UPV/EHU) in Spain and at the Technische Universität Dresden in Germany have proposed inorganic oxide nanotubes as natural means of reinforcements of cement pastes, in view of their chemically compatibility with the cement-water system. The team reports their findings in the May 16, 2012 online edition of Advanced Materials ("Do Cement Nanotubes exist?"). 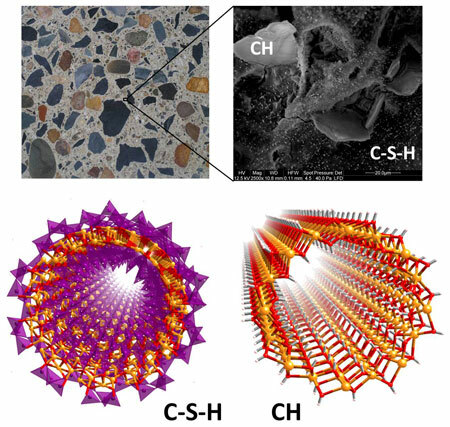 Their new approach may help scientists to synthesize nanotubes made of calcium silicate hydrates,which the team proposes as ideal mechanical reinforcements for cement pastes. "Previous experiments on nanotube reinforcements of cement haven't fully addressed inorganic nanotubes, which is actually one of our ideas for future development of the field," explains Ayuela. "Following the discovery of CNTs, new tubular structures have been developed using layered inorganic compounds. Indeed, a number of families of inorganic nanotubes have been investigated in recent years, including metal dichalcogenides (sulphides, selenides and tellurides), halides (chlorides, bromides and iodides), as well as various ternary or quaternary compounds, oxides and hydroxides." In their work, the team focused on cement-based nanotubes fabricated from calcium silicate hydrate gel and calcium hydroxide precipitates. They succeeded in demonstrating the feasibility of these cement nanotubes in view of their stability at room temperature, with strain energies in agreement with values previously obtained for other nanotubes compounds. They also point out that the high Young moduli and ultimate tensile strengths of cementitious nanotubes make them a viable alternative as reinforcement for cement pastes. Ayuela and his collaborators have shown that especially portlandite nanotubes support strain energies similar to those for already synthesized carbon and inorganic nanotubes. "In our investigations we also looked at the tensile stress-strain profile under static deformation of portlandite nanotubes," he says. "We found that stress increases almost linearly up to a strain of 27%, at which point failure occurs in the nanotube. The corresponding critical stress is 8.4 GPa, which is about 10% of the Young's modulus. This relationship is in excellent agreement with previous calculations for other inorganic types of nanotubes." He notes that these values of about 8 GPa greatly exceed the tensile strengths of cement pastes and are at least an order of magnitude higher than those of typical reinforcing materials such as structural steels ( which is about 0.5 GPa). Being able to calculate the stability of cementitious nanotubes, as the team has done, is an important step in developing suitable synthesis processes for these nanotubes. Having shown the stability and good mechanical properties of these cementitious inorganic nanotubes, the team is now interested in describing their survival in different water solutions, where myriad of reactions take place to form the cement paste.